Kenneth Foote, professor and head of the Department of Geography in the College of Liberal Arts and Sciences, is a specialist in cultural and historical geography and author of the book Shadowed Ground: American Landscapes of Violence and Tragedy (University of Texas Press), which examines how Americans have dealt with the after-effects of tragedy. He spoke with UConn Today about the recent shootings in Las Vegas and how such incidents are memorialized. What were your thoughts when you saw the news on the Las Vegas shootings? What I’m reminded of almost immediately is the parallels with the way places have been treated after events like this in the past. I’m wondering what will happen. I expect there will be a tremendous amount of community remorse, some efforts to develop a memorial or monument there. It may become the site of a continuing pilgrimage or ceremony, because people do feel that loss at the family level, the community level all across the nation. You’ve looked at the subject of memorials specifically for your research focusing on well-known memorials built many years after an event or battle. You’ve said there seems to be a generational difference in when this happens now. I think there has been a shift. It’s quite recently that people have been willing to note or mark the loss caused by mass murder, bombings, and other malicious acts of violence. Those events often carry a strong sense of shame, and communities don’t want to call attention to such atrocities. Up until the 1960s or ’70s, it was very rare for events like mass murder to be commemorated at all. There was that sense we will do something at the cemetery, we will do something from a personal point of meaning, but not at the site itself. I think the change is that no matter how horrible the crime, that something should be done for the victims, for the victims’ families, for the community. There have been these terrible killings; we don’t want to forget the victims themselves. You mention the 1960s, and for many their thoughts would go to Dealey Plaza in Dallas on Nov. 22, 1963 and the assassination of President John F. Kennedy. Is that a marking point? Absolutely. That case is very informative. There was incredible resistance to marking the site of the Texas School Book Depository, and it was a long time before they put up the cenotaph for Kennedy close to the assassination. For many of these events, one of the real tensions is that by drawing attention to the killing, it also draws attention to the killer. In Dallas, people objected to creating a museum at the former School Book Depository, arguing that it would serve as a tribute honoring Oswald rather than Kennedy. That building was almost torn down, and in some ways I find it remarkable that it still exists. The ’60s was a very violent decade because it was not just John Kennedy. It was the killings of Malcolm X, Martin Luther King, Robert Kennedy, the death toll of the Vietnam War, urban riots, the assassination of Black Panthers in Chicago, and [in 1970,] events like Kent State and Jackson State. Eventually some of these events were marked, because they were tied to very important issues like civil rights or the anti-Vietnam War movement, but others have largely disappeared from view. But beginning in this period, it became a bit more common to commemorate and remember a greater range of violence, no matter how horrible. That leads to the question of what type of memorial to establish, if any. UConn art historians Robin Greeley and Michael Orawicz have worked on this issue in the area of human rights violations and the appropriate way to honor victims. After initial violence like that in Las Vegas, what is appropriate? People oftentimes make the point it is better to have a living memorial that involves fellowships, teaching, and regular activities that serve to remember and honor those who have died. I’m thinking of the efforts in New York City to create more of a living memorial for the Triangle Shirtwaist Factory fire in 1911. Every year, there are events where they chalk the names of the victims on the sidewalks where they lived, to make it evident to the people of the community how much has been lost. These living memorials, I think, got beyond the notion of creating a single physical monument or memorial. Another change is that in recent decades, artists and landscape architects have been trying to develop innovative ways of symbolizing and expressing loss and grief. Good examples are the Vietnam Veterans Memorial in Washington, D.C., or the Oklahoma City bombing memorial. The Oklahoma City memorial provides different spaces in the area of the memorial for people to reflect on the event from the standpoint from those killed, the rescuers, the children who were lost, and so forth. The artists and designers are being much more reflective of the meaning of these events and trying to express these meanings in new symbolic forms. Other new monuments, like Memorial to the Murdered Jews of Europe in Berlin or many other Holocaust memorials in Europe, reflect this trend. You started writing Shadowed Ground looking at historically significant places. Do you see a distinct difference in activity around a war memorial versus a mass violence situation? They are interpreted very differently. The book project got started in Salem, the site of the witch trials. It was just visiting Salem and seeing that there was very little marked at the time I first visited. The next case was the horrible mass murder at a McDonald’s in San Ysidro, California. That really hit me: how was this going to affect the community? The first cases were mass murders, and then I moved on. Battlefields are marked and wrapped into this national tradition. They become points of moral or ethical lessons or to celebrate the heroism of the soldiers. As we know from this [current] debate over the Confederate memorials, the politics of interpretation involve a wide range of issues about slavery, race, and history that remain alive today. And each of America’s wars raises different issues and tensions, and each is celebrated and commemorated in a slightly different way. After the elementary school shootings in Sandy Hook, Connecticut, you wrote a piece for The Hartford Courant outlining the process you think needs to take place before these decisions can be made, including asking how to prevent such violence and how to properly mourn and remember the victims. More recently, there has been discussion about remembering the victims of the Pulse Nightclub shootings in Florida. Have you seen this process change? One part of the process I continue to stress is that after events like the Orlando and Las Vegas shootings, there is almost always an attempt to distance the killer from the community. I call it “othering,” but it’s basically an effort to distance the killer from the community by explaining away the violence as the act of a unstable or deranged person. Rather than search for ways to prevent future violence, it’s easier to say the killer was crazy, is now dead, and this sort of thing won’t happen again. But this speaks to a larger issue – that it is very difficult for people to accept that members of their own communities are sometimes willing to turn their guns on their neighbors. This happened almost right away in Las Vegas, with the murderer described as a sort of mysterious, furtive loner who came from outside the community. How has your thinking changed about these issues, given the events that have since occurred in the past decade? The speed of this memorialization has ramped up. I was looking at sites from the Revolutionary War and the Civil War, and they could take decades or centuries before people would settle on how to build them into this narrative of the national past. Now people are doing this within a year, two years. 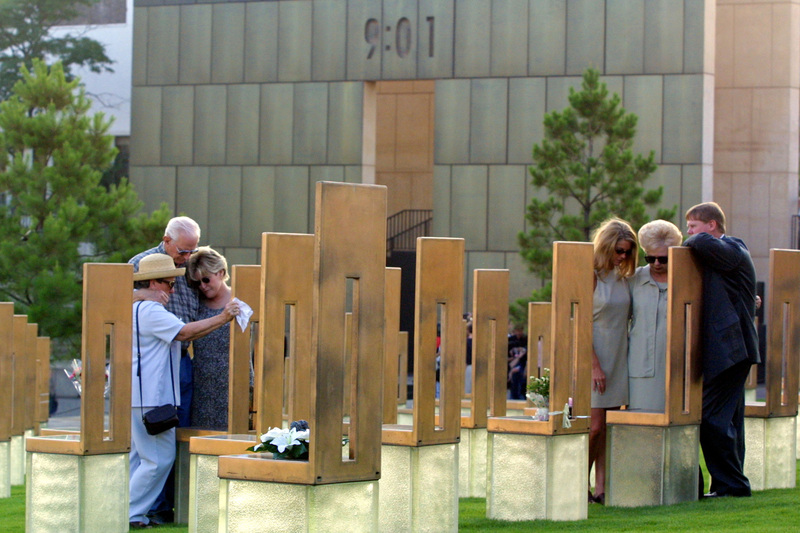 The Oklahoma City memorial went up within five years. I think some of those sites like Oklahoma City have set a precedent in terms of trying to make sure the different constituencies are consulted during the process, rather than just the victims’ families or the survivors. This is important because events like 9-11 impact lots of people outside of the immediate community. When I was writing Shadowed Ground, I was focusing mostly on historic events rather than contemporary events. I discounted those temporary, spontaneous memorials and the personal things left behind. Since then I’ve changed my mind. I’ve worked with my friend Sylvia Grieder, [professor emerita of anthropology] at Texas A&M, one of the people who began to write about these memorials. She noticed that “spontaneous” shrines or “makeshift” memorials were anything but spontaneous or makeshift. Instead, people invested considerable time and thought in trying to personalize such memorials. It was not just teddy bears and candles. People really try to tailor them to the individual being honored. Now I realize the early process that we’re seeing in Las Vegas is very important because it established the debate, the main themes about what will be done and how this will be judged in the long term. Where do you see the need to establish memorials going? First, I think it’s better to mark than not to mark. Marking tragedies and honoring the dead forces the issues behind the violence into the open. Hiding the evidence and scars of such events is, in many ways, an act of denial. Denial is perhaps the easy way out, kind of like arguing that if we ignore violence it will simply go away. I think we will continue to see denial as one of the most common outcomes after events like the Las Vegas shootings. I find it promising that sites of violence and tragedy sometimes become rallying points for change. They are places or events around which people take a stand and say they aren’t going to put up with violence anymore. We’re going to try and end gun violence and do things to prevent these and others kinds of atrocity from coming around again. I think of sites like the Stonewall Inn in New York City, which became this rallying point for the gay rights movement, or the Manzanar Japanese-American relocation center in California from the period of the Second World War that became a place for reunions and rallies that helped lead to redress legislation for the families that were unjustly interned. These days, some of the most exciting developments involve greater recognition of sites associated with African American history and Native American heritage – even those of extreme violence, such as those associated with America’s legacy of slavery and dispossession and violence against native peoples. So perhaps we will sometimes see an event like Las Vegas turn the corner on debates over mass violence and become a rallying point for finding solutions rather than excuses.